It isn't often that my food expectations are exceeded at a restaurant but my favorite local restaurant, the Sideboard, in Danville, continues to pleasantly surprise me. Today's unexpected delight: this hot chocolate! 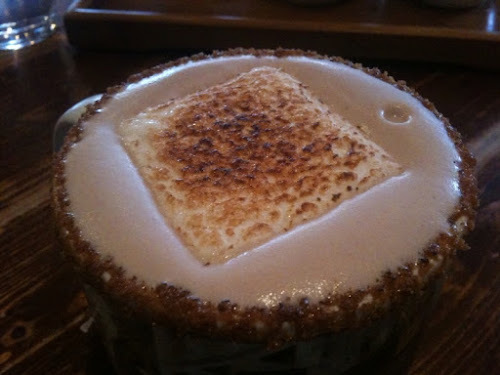 When I ordered hot chocolate, I didn't expect to receive a gently toasted marshmallow atop milk foam rimmed in graham cracker over the chocolatey warmth. Can you imagine the memory of campfire s'mores flooding my senses as I took an indulgent bite of that bruleed marshmallow? And that taste of summertime in the middle of winter was marvelous. If you find yourself in Danville at the Sideboard, I also highly recommend the beet, fennel and grapefruit salad- posted here. It's my standard order with a side of pommes frites. All of a sudden I am REALLY craving hot chocolate, with marshmallows and graham cracker crusty thing. Mmmm. Looks delicious.